The Bangladesh Army (BA, Bengali: বাংলাদেশ সেনাবাহিনী, Bangladesh Senabahini) is the land forces branch and the largest of the three defence service of the Bangladesh Armed Forces. The primary mission of the Army is to provide necessary forces and capabilities in support of Bangladesh's security and defence strategies including defence of the nation's territorial integrity against external attack. Control and operations are administered by the Department of the Army of the Armed Forces Division. In addition to its primary mission the Bangladesh Army is also constitutionally obligated to assist the civilian government during times of national emergency. This role is commonly referred to as "aid to civil administration". The martial tradition of Bengal has its roots in the army of Kings and their chiefs who were called Senapati or Mahasenapati. Armies were composed of infantry, cavalry, war elephants and war boats. The arrival of Muslims and the establishment of the Bengal Sultanate further strengthened the military. The sultanate had well organised disciplined armies. During Mughal rule Cannons and artillery were introduced to Bengal. During the Colonial Rule of the British, Bengal was principally a bulwark of British power and trade in the South Asian region. The British under Robert Clive defeated a 50,000 strong Bengal Army of Nawab Siraj-ud-daullah in the Polashey(Plassey) in 1757 and later the forces of Nawab Mir Qasim at the Battle of Buxar in 1764. The Army of Bengal was formed, which later became part of a united Indian Army from 1895 to 1947. The eastern part of the British India was a prominent place for military and police recruitment, with entire horse-mounted cavalry and lancer units being recruited there prior to the Bengal Sepoy Mutiny of 1857. Post-mutiny, units with the epithet "Bengal" in their name, such as Bengal Sappers and Bengal Cavalry, were largely recruited from non-Bengali peoples from Bihar, Varanasi and Uttar Pradesh which were technically still part of Bengal Presidency at that time. During the First World War, the Bangali Paltan was formed to recruit soldiers from Bengal. In 1916, the British Government created Bengali Double Company. They soldiers were trained in Karachi and shipped to the Bagdad. They fought in the war and after the war helped crush a rebellion by Kurds in 1919. During the Second World War, British Armed Forces Eastern Command created an auxiliary force who were part engineers and part infantry named as Indian Pioneer Corps. Most of the soldiers were recruited from both West and East Bengal. This force assisted the main war effort by building roads, airfields, fortifications and, when needed, fought the Japanese in an infantry role. These force was organised in company groups attached to various regiments of Indian Army in direct support role. Captain Abdul Gani was a Company Commander in the Burma front and led his troops in battle. After the war these Pioneer Troops were concentrated in Jalna, India, waiting to be demobilised and return home. In 1946 Captain Ghani the then Adjutant and Quartermaster of Indian Pioneer Corps Centre at Jalna envisioned and generated the idea of forming an Infantry regiment out of the Pioneer soldiers from East Bengal who would be returning home demobilised, to the Centre Commander. After receiving permission from the Chief of Staff of Pakistan Army General Sir Frank Messervy, he organised his men to form the nucleus of an Infantry Regiment, the Bangali Paltan (Platoon). At the time of the creation of Pakistan Captain Ghani got the approval of the then newly appointed Commander in Chief to Pakistan Army General Messervey to form the East Bengal Regiment composed solely of youths from East Bengal, would be East Pakistan. On 17 August 1947 General Messervey while bidding farewell to the Pioneer Corps soldiers from Bombay the General endorsed the views of Captain Ghani and said' you will prove to the world that Bengali soldiers are equally competent as other nations of the world.' With these inspiring words Captain Ghani moved to Dhaka in September 1947 with two Pioneer Companies and was temporarily located in Pilkhana now the Headquarters of Border Guards Bangladesh. He was later told by the administration to find a suitable place to accommodate the soldiers. He moved to the north of the Capital and found Kurmitola as the perfect place for a cantonment. Toiling day in and day out the barracks were constructed and jungles cleared, parade ground prepared. On 15 February 1948 the flag of First East Bengal Regiment the pioneer of Bangladesh Army was raised with Captain Ghani on the lead of all the affairs though the first commanding officer was British Lt Col V J E Patterson. After the raising of the first battalion the second battalion was approved Captain Gani began to recruit the personnel for the regiment. On 7 February 1949 the flag of the Second East Bengal was raised with the newly recruited soldiers and from personnel from First East Bengal. Before the Bangladesh Liberation War in 1971, a total of 8 battalions of the East Bengal Regiment were formed. In 1970 Sheikh Mujibur Rahman lead Bangladesh Awami League to win the General Elections of Pakistan. The Pakistan Army which was then in power refused to handover power and unrest broke out. On 25 March 1971 Pakistan Armed Forces cracked down on the civilian population of East Pakistan through the start of Operation Searchlight and Sheikh Mujibur Rahman declared the independence of Bangladesh. The Pakistan Army and allied paramilitaries killed hundreds of thousands of civilians and uniformed personnel. As a result, in March 1971, Bengali soldiers in East Pakistan revolted and the Bangladesh Liberation War started. There was a Bangladesh Army Sector Commanders Conference during 11–17 July 1971. The conference was held three months after the oath of the newly formed Bangladesh Government at Meherpur, Kushtia. During this conference the structure and formation as well as resolving issues surrounding the organisation of the various sectors, strategy and reinforcements of the Bangladeshi forces was determined. It was of considerable historical importance from a tactical point of view, as it determined the command structure of the Bangladeshi forces throughout Bangladesh Liberation War. This conference was presided over by the Bangladesh interim government in exile, headed by then Prime Minister Tajuddin Ahmed and Colonel (Retd.) M. A. G. Osmani was made the chairman of the Joint Chiefs of Staff of the Bangladesh Armed Forces. M. A. G. Osmani was reinstated into active duty from his retirement. Principal participants of this conference included: Squadron Leader M. Hamidullah Khan, Major Ziaur Rahman, Major Abdul Jalil, Captain ATM Haider, Lt. Col. MA Rab and Major Khaled Mosharraf. As a result of this meeting, Bangladesh was divided into eleven sectors. These sectors were placed under the control of Sector Commanders, who would direct the guerilla war against Pakistani occupation forces. For better efficiency in military operations each of the sectors were also divided into a number of sub-sectors. As a point of note, the 10th Sector was under direct command of the Commander-in-Chief and included the Naval Commando Unit as a C-in-C's special force. K Force, under Major Khaled Mosharraf, was created with 4th, 9th and 10th East Bengal Regiment. S Force, under Major K M Shafiullah, was created with 2nd and 11th East Bengal Regiment. Z Force, under Major Ziaur Rahman, was created with 1st, 3rd and 8th East Bengal Regiment. During the sensitive and formative years after the end of the war, personnel of the Mukti Bahini were absorbed into different branches of Bangladesh Army. In 1974 Bangladeshi soldiers and officers repatriated from Pakistan after the Bangladesh Liberation war were absorbed into Bangladesh Army. During the 1972-73 tenure, engineers, signals, army services, ordnance, military police, remount veterinary and farm and medical corps was established in Bangladesh Army. Bangladesh military academy was established in Cumilla cantonment in 1974. On 11 January 1975, the passing out parade of the first Bangladesh Army short course took place. In 1975 the President Guard Regiment (PGR) was established. There were suspicion among the army personnel of the formation of the paramilitary Jatiya Rakhi Bahini and the addition of civilian Mukti Bahini members in it. These suspicions and misconceptions laid the foundation and formed the bedrock of disputes between professional army officers and the ruling administration which led to a very bloody chapter in the history of newly independent Bangladesh. On 15 August 1975 a few sacked army officers, disgruntled junior officers and NCOs secretly planned and assassinated President Sheikh Mujibur Rahman and his entire family at his personal residence in Dhanmondi, Dhaka, except for his two daughters (Sheikh Hasina and Sheikh Rehana) who were abroad. Five of those responsible officers were executed in January 2010 while others are still absconding and are outside Bangladesh. After the assassination of Sheikh Mujibur Rahman, new government led by Khandkar Mushtaq Ahmed and supported by the coup plotters was set in place. Khandakar Mushtaq passed the Indemnity ordinance which provided immunity to the assassins of Sheikh Muibur Rahman. Three months later on 3 November 1975, several senior officers and NCO's led by Maj. Gen. Khaled Mosharraf and Colonel Shafaat Jamil led their own forces to remove Khandakar Mushtaq's government from power whom they believed was an unlawful government in the first place. That same day the same group of disgruntled army personnel who assassinated Sheikh Mujib and had jailed politicians involved with the Bangladesh Liberation war, assassinated Syed Nazrul Islam, Tajuddin Ahmed, Muhammad Mansur Ali and AHM Qamaruzzaman in Dhaka Central Jail. Chief of Army Staff, Major General Ziaur Rahman was placed under house arrest. On 7 November 1975, a short but highly organised uprising concentrated only in Dhaka, formed by members of the Jatiyo Samajtantrik Dal (National Socialist Party) and members of enlisted personnel led by Lt. Col. (Retd.) Abu Taher also resulted in the killing of several army and air force officers and soldiers including Major General Khaled Mosharraf, Major ATM Haider. Colonel Shafaat Jamil was arrested and forcibly retired. Colonel Abu Taher released Major General Ziaur Rahman who was imprisoned by Khaled Mosharraf. Ziaur Rahman took promotion to Lieutenant General and appointed himself as the Chief of Army Staff and Deputy Chief Martial Law Administrator. He then executed Lt. Col. Taher for his role in the coup on 7 November. Later, in 1977 under a public referendum of a yes no vote he took the helm as President. On 30 May 1981 President Ziaur Rahman was assassinated in the Chattogram Circuit House in a military coup. Less than a year later, the then Chief of Army Staff Lt. Gen. Hussein Muhammad Ershad on 24 March 1982 took power in a silent coup at dawn, suspended the constitution and imposed martial law and remained in power through farce elections and corruption. He remained in power until 6 December 1990. The Chattogram Hill Tracts Conflict was the political and military conflict between the Government of Bangladesh and the Parbatya Chattagram Jana Sanghati Samiti (United People's Party of the Chattogram Hill Tracts) and its armed wing, the Shanti Bahini over the issue of autonomy and the rights of the tribes of the Chattogram Hill Tracts. The Shanti Bahini launched an insurgency against government forces in 1977, and the conflict continued for twenty years until the Bangladesh government and the PCJSS signed the Chattogram Hill Tracts Peace Accord in 1997. At the outbreak of the insurgency, the Government of Bangladesh deployed the army to begin counter-insurgency operations. The then-President of Bangladesh Major General Ziaur Rahman created a Chittagong Hill Tracts Development Board under an army general to address the socio-economic needs of the region, but the entity proved unpopular and became a source of antagonism and mistrust among the local tribes against the government. The government failed to address the long-standing issue of the displacement of tribal people, numbering an estimated 100,000 caused by the construction of the Kaptai Dam by the then Pakistan government in 1962. Displaced tribesmen did not receive compensation and more than 40,000 Chakma tribals had fled to India. In the 1980s, the government began settling Bengalis in the region, causing the eviction of many tribesmen and a significant alteration of demographics. Having constituted only 11.6% of the regional population in 1974, the number of Bangalis grew by 1991 to constitute 48.5% of the regional population. Peace negotiations were initiated after the restoration of democracy in Bangladesh in 1991, but little progress was made with the government of Prime Minister Begum Khaleda Zia and her Bangladesh Nationalist Party. Fresh rounds of talks began in 1996 with the newly elected prime minister Sheikh Hasina Wajed of the Awami League. The Chattogram Hill Tracts Peace Accord was finalised and formally signed on 2 December 1997. Humanitarian operation after Cyclone Sidr 2. Following the 1975 coup, additional personnel were absorbed into the regular army when the martial law government abolished the Jatiyo Rakkhi Bahini. Under Zia's rule, Bangladesh was divided into five military regions. When Ershad assumed power in 1982, army strength had stabilised at about 70,000 troops. Starting in 1985, the army had experienced another spurt in growth. As of mid-1988, it had about 90,000 troops (although some observers believed the number was closer to 80,000), triple the 1975 figure. Bangladesh Armed Forces participated in the Gulf war in 1991 Operation Desert Storm alongside other multinational forces under Allied Command. The Bangladesh Army brought in a contingent of Engineers and undertook the task of clearing mines and bombs in Kuwait. This assistance took place under the operational code name "Operation Kuwait Punargathan (OKP)" in English "Operation Rebuilding Kuwait (ORK)". The Bangladesh Army structure is similar to the armies of the Commonwealth Nations. However, major changes have taken place following the adoption of US Army tactical planning procedures, training management techniques and noncommissioned officer educational systems. Bangladesh armed forces are going through a long term modernization plan named Forces Goal 2030. Bangladesh army is under a massive expansion and modernization drive as per the plan. The force is being divided into three corps — Central, Eastern and Western. Three new infantry divisions have been raised, the 17th infantry division at Sylhet, 10th infantry division at Ramu in Cox's Bazar and 7th infantry division at Barishal-Patuakhali to make the number of total infantry divisions ten. The soldiers are being equipped with modern gear like Night Vision Goggles (NVG), Ballistic helmets, Eye protective gear, Bulletproof vest, person to person communicators, palmtop GPS device and BD-08 assault rifles with Collimator sight. To increase special operation capabilities, 2nd Commando Battalion has been raised. The two battalions formed sole the para-commando brigade of the country. Bangladesh Army procured 44 MBT-2000 tanks from China in 2011. Bangladesh army engineers have completed the upgrade of Type 69 tanks to Type 69IIG standard. They are now upgrading 174 Type 59 tanks to Type 59G Durjoy standard. To increase the mobility of the infantry forces, 300 armoured vehicles such as BTR-80 APC, Otokar Cobra LAV and BOV M11 ARV have been procured. To modernize the artillery forces, Nora B-52 K2 self-propelled artillery system have been procured from Serbia. Their firepower is further increased by the addition of two regiment of WS-22 Guided Multiple Rocket Launcher System. For anti-tank role Metis-M missile systems and PF-98 rocket systems were procured. Two regiments of FM 90 surface to air missile were added in 2016 to enhance air defence capabilities. The army aviation wing is also being modernized. Two Eurocopter AS365 Dauphins were put into service in 2012. Six Mil Mi-171Sh were procured in 2016. One C-295W transport aircraft was ordered from Spain which was delivered in 2017. Bangladesh Army also procured 36 Bramor C4EYE battlefield reconnaissance UAV from Slovenia in 2017. The Bangladesh Army has been actively involved in a number of United Nations Peace Support Operations (UNPSO) since its formation in the 1970s. Its first deployments came in 1988, when it participated in two operations – UNIIMOG in Iraq and UNTAG in Namibia President HM Ershad initiated these deployments for the first time, starting with the contribution to UNIIMOG in Iraq. Later, as part of the UNIKOM force deployed to Kuwait and Saudi Arabia following the Gulf War the Bangladesh Army sent a mechanised infantry battalion (approx. 2,193 personnel). Since then, the Bangladesh Army has been involved in up to thirty different UNPKOs in as many as twenty five countries. This has included activities in Angola, Namibia, Cambodia, Somalia, Sudan, Eritrea, Uganda, Rwanda, Bosnia & Herzegovina, Mozambique, former Yugoslavia, Liberia, Haiti, Tajikistan, Western Sahara, Sierra Leone, Kosovo, Georgia, East Timor, Congo, Côte d'Ivoire and Ethiopia. As a result of its contributions to various UN peacekeeping operations, up to 88 Bangladesh soldiers have lost their lives (as of February 2009). However, the performance of Bangladesh's contingents has been described as being of the "highest order" and the appointment of several senior Bangladesh military officers as the Commander of UN peacekeeping missions and Senior Military Liaison Officers, may be seen as further recognition of the Bangladesh Army's growing esteem in the peacekeeping community. In January 2004, BBC described the Bangladeshi UN Force as "Cream of UN Peacekeepers". Bangladesh Army has specialised its peacekeeping operation capabilities around the world through participation in numerous peacekeeping and nation building operations. It has created BIPSOT (Bangladesh Institute of Peace Support Operation Training) which specialises in the training of peacekeepers for employment in all types of UNPSO (UN Peace Support Operations). This institute fulfills the requirement of UNDPKO as per U.N. General Assembly resolution which outlines 'the necessity and responsibility of every nation to train their armed forces before any deployment. Bangladeshi soldiers unload a shipment of bottled water for cyclone victims. Commission is given in Bangladesh Military Academy and commissioned officers are honoured as 'first class gazetted officer' by the Bangladesh government. NCO rank starts from Lance Corporal. Sergeants holds key appointments in companies, batteries (company equivalent of artillery), infantry battalions and artillery regiments, e.g. Company Quartermaster Sergeant (CQMS), Regimental Sergeant Major (RSM), persons holding these appointments have separate rank insignias though these are not actually ranks. Cantonments are where Bangladesh Army personnel work, train, and live. Bangladesh Army University of Science And Technology (BAUST), Saidpur Cantonment, Nilphamari. Military Institute of Science and Technology (MIST), Mirpur Cantonment, Dhaka. Bangladesh University of Professionals (BUP), Mirpur Cantonment, Dhaka. Bangladesh Army University of Engineering & Technology (BAUET) Qadirabad Cantonment, Natore. Defence Services Command and Staff College (DSC&S), Mirpur Cantonment, Dhaka. Bangladesh Army International University of Science & Technology (BAIUST), Mainamati Cantonment, Cumilla. Armoured Corps Centre & School (ACC&S), Majira Cantonment, Bogura. Engineer Centre and School of Military Engineering (ECSME), Quadirabad Cantonment, . Signal Training Centre and School (STC&S), Jashore Cantonment, Jashore. Army Service Corps Centre & School (ASCC&S), Jahanabad Cantonment, Khulna. Electrical and Mechanical Engineering Centre and School (EMEC&S), Saidpur Cantonment, Nilphamari. Centre and School of Military Police, Education and Administration (CSMEA), Shahid Salahuddin Cantonment, Ghatail, Tangail. Army School of Music (ASM), Chattogram Cantonment, Chattogram. Artillery Centre and School (AC&S), Halishahar, Chattogram. School of Military Intelligence (SMI), Cumilla Cantonment, Cumilla. East Bengal Regimental Centre (EBRC), Chattogram Cantonment, Chattogram. Bangladesh Infantry Regimental Centre (BIRC), Rajshahi Cantonment, Rajshahi. Non Commissioned Officers Academy (NCOA), Majira Cantonment, Bogura. Bangladesh National Cadet Corps (BNCC). Bangladesh has made a long term modernisation plan for its Armed Forces named Forces Goal 2030. As per the plan, Bangladesh Army will be divided into three corps — Central, Eastern and Western. A riverine brigade is being formed at Mithamain of Kishoreganj district. Government has a plan to add 97 new units within 2021. Of them, 19 units will be formed for the Sylhet Cantonment, 22 for the Ramu Cantonment and 56 units for the Sheikh Hasina Cantonment in Lebukhali. A Riverine Engineer Battalion is also going to be formed under a proposed cantonment at Mithamoine in Kishorganj. Formation of two new tank regiments is under consideration. Process of converting some regular infantry battalions into para infantry battalions and mechanized infantry battalions is also going on. Bangladesh Army has started an ambitious modernisation program for its infantry soldiers named Infantry Soldier System. This system includes equipping all of its soldiers with modern equipment like Night Vision Goggles (NVG), Ballistic helmets, Eye protective gear, Bulletproof vest, person to person communicators, palmtop GPS device and BD-08 assault rifles with Collimator sight. Tender has been floated for procurement of a command ship for army to be made in any Bangladeshi shipyard. The ship will be around 30 meters in length, 8 meters in breadth and an endurance of minimum 15 days. It will have a complement of 15 personnel and a maximum range of 2200 nautical miles with a top speed of 20 knots. The vessel will be used as a floating command centre during different operations. Bangladesh Army signed a contract with Western Marine Shipyard for the supply of two Landing Craft Tanks in 2017. The ships will be 68 metres long and will be able to carry eight tanks. A contract has been signed between Bangladesh Army and Turkish Delta Defence for the supply of 600 Tur K-2 4x4 and 80 Tur K-3 6x6 Light Armoured Vehicles (LAV). The first 100 armoured vehicles will be delivered in 2018, another 150 in 2019 and the rest within 2022. In September 2017, Bangladesh army started the light tank procurement process. tender was published with necessary technical details Evaluation process of 155mm howitzer also started in September 2017. In November 2017, Bangladesh army started the evaluation process of 122 mm field artillery howitzers. In the same month, army also published the evaluation notice for Light Armoured Vehicles (LAV). Later on in November 2017, the Bangladesh Army published the tender for the procurement of 105mm towed field artillery systems. Bangladesh government has adopted a re-structuring plan for the Army aviation group. As per the plan the Army aviation group will be renamed Army aviation. The manpower of the unit will be raised from 204 to 704 personnel. By 2021, the number of aircraft operated by army aviation will be twenty six. The army aviation maintenance workshop with 147 manpower will be re-structured to army aviation engineering workshop with 490 personnel. An aviation directorate will also be formed for the army. Bangladesh army issued tender for procuring two Troops Carrier Vessel (TCV) in January 2018. The vessels needed to be of 55m length and 10m breadth in minimum. The vessels have to have the ability to stay at sea for 15 days with 200 personnel. The minimum displacement of the vessels will be 150 tons and they will be able to sustain sea state 4. In the same month, another tender was floated for two Landing craft tanks. These crafts will have to be of 65m to 72m in length and 13.5m to 14m in breadth with a draft of 3m. The vessel will have to have the accommodation facilities of 20 officers and 40 soldiers and will be able to carry eight main battle tanks. They will be able to stay at sea for 15 days and sustain sea state 4. Both types of ships will be armed with four 14.5mm anti-aircraft machine guns for self defense. In March 2018, Bangladesh Army issued tender for the procurement of 220 anti-tank weapons. The models shortlisted are Russian RPG-7V2 and Chinese Tyoe 69-1. In the same month, another tender was floated for two local warning radars. The models shortlisted for the tender are Ground Master 400 of Thales, TRML 3D/32 of Hensoldt and KRONOS Land of Leonardo. Army also issued tender for procuring 181 Man-portable air-defense systems. Here, Chinese FN-16, Russian Igla-S and Swedish RBS 70 systems has been shortlisted. In April 2018, Bangladesh Army issued RFI notice for the procurement of long range Multiple Launch Rocket System (MLRS) systems. As per the notice, the MLRS system have to have a range of 120-280 kilometres. In the same month, another RFI was published for procurement of assault rifles and submachine guns. Later on in the same month, tender was published for two Landing craft tanks. Evaluation notice for medium range Anti-tank guided missile was also published in April 2018. ^ "সশস্ত্র বাহিনীর সদস্য ২ লাখ ৪ হাজার ৫৯৬ জন". banglanews24.com. Retrieved 9 June 2017. ^ "Shafiqur made CGS, Mujibur new DG of SSF". The Independent. Dhaka. 31 July 2018. Retrieved 2 August 2018. ^ Ashraf, Ahmed. "বাংলাদেশ সেনাবাহিনীতে যোগ দেয়ার আগে যে বিষয়গুলো জানতে হবে (translation: Things to know before joining the Bangladesh Army)". Newspaper1971 Magazine. Newspaper1971.com. Archived from the original on 6 May 2016. Retrieved 6 May 2016. ^ a b c d e f g h i j Uddin Khan, Saleh; Waheduzzaman, Syed. "Military". en.banglapedia.org. Banglapedia. Retrieved 8 December 2017. ^ Ganesan, V. B. (16 December 2013). "1857 War and the unsung heroes of Bengal". The Hindu. ISSN 0971-751X. Retrieved 8 December 2017. ^ Bhargava, Moti Lal (1970). History of modern India. Upper India Pub. House. p. 296. ^ "Rare 1857 reports on Bengal uprisings - Times of India". The Times of India. Retrieved 8 December 2017. ^ "Bangali Paltan - Banglapedia". en.banglapedia.org. Retrieved 8 December 2017. ^ a b "War of Liberation, The - Banglapedia". en.banglapedia.org. Retrieved 8 December 2017. ^ "Proclamation of Independence - Banglapedia". en.banglapedia.org. Retrieved 8 December 2017. ^ Nanda, Ravi (1 December 1987). Evolution of national strategy of India. Lancers Books. p. 67. ISBN 9788170950004. ^ Pandey, Punam (26 November 2016). India Bangladesh Domestic Politics: The River Ganges Water Issues. Springer. p. 51. ISBN 9789811023712. ^ "Rahman, Bangabandhu Sheikh Mujibur - Banglapedia". en.banglapedia.org. Retrieved 8 December 2017. ^ "5 Bangabandhu killers hanged". The Daily Star. 28 January 2010. Retrieved 8 December 2017. ^ "Ahmad, Khondakar Mostaq - Banglapedia". en.banglapedia.org. Retrieved 8 December 2017. ^ "'None of us were even allowed to see his grave'". Dhaka Tribune. Retrieved 8 December 2017. ^ "What we lost on November 3, 1975". The Daily Star. 3 November 2017. Retrieved 8 December 2017. ^ "The strange case of Colonel Taher - Indian Express". archive.indianexpress.com. Retrieved 8 December 2017. ^ "Taher execution an outright murder: HC". The Daily Star. 20 May 2013. Retrieved 8 December 2017. ^ "Taher, Colonel Abu - Banglapedia". en.banglapedia.org. Retrieved 8 December 2017. ^ "Rahman, Shahid Ziaur - Banglapedia". en.banglapedia.org. Retrieved 8 December 2017. ^ "Ershad, Lt. General Hussein M - Banglapedia". en.banglapedia.org. Retrieved 8 December 2017. ^ a b "Chittagong Hill Tracts Peace Accord, 1997 - Banglapedia". en.banglapedia.org. Retrieved 8 December 2017. ^ "UNPO: Chittagong Hill Tracts: Local Human Rights Group Releases Report on Worrying Situation in Bangladesh". unpo.org. Retrieved 8 December 2017. ^ "CHT- Struggle for peace". The Daily Star. 2 December 2013. Retrieved 8 December 2017. ^ a b Majumder, Shantanu (2012). "Parbatya Chattagram Jana-Samhati Samiti". In Islam, Sirajul; Jamal, Ahmed A. (eds.). Banglapedia: National Encyclopedia of Bangladesh (Second ed.). Asiatic Society of Bangladesh. ^ "Bangladesh-Kuwait joint effort to fight terrorism". The Independent. Dhaka. Retrieved 8 December 2017. ^ a b "Army plans to work under three corps". The Independent. Dhaka. Retrieved 12 September 2016. ^ "PM launches 17 Infantry Division". Dhaka Tribune. Retrieved 21 September 2015. ^ "PM urges army to remain prepared against any threat to democracy". Bangladesh Sangbad Sangstha. Archived from the original on 28 November 2016. Retrieved 8 February 2018. ^ "PM inaugurates Sheikh Hasina Cantonment in Patuakhali". Dhaka Tribune. 8 February 2018. Retrieved 8 February 2018. ^ "Recounting 'Operation Thunderbolt'". The Daily Star. 3 July 2017. Retrieved 11 August 2017. ^ "Bangladesh Eyes China Arms". The Diplomat. Retrieved 22 December 2015. ^ a b "Modernisation of army to continue". The Daily Star. 29 May 2015. Retrieved 8 December 2017. ^ "Prime Minister Hasina expects greater involvement of army in development efforts". bdnews24.com. 28 May 2015. ^ "Modernisation of army to continue: PM". United News of Bangladesh (UNB). 28 May 2015. Archived from the original on 23 January 2016. ^ a b "Bangladesh Army gets self-propelled howitzer NORA B-52 K1 SP and Metis M-1 anti-tank missiles". Asian Defence News. 26 December 2013. Retrieved 19 December 2016. ^ "Modernisation of army to continue". The Daily Star. Dhaka. Retrieved 23 December 2015. 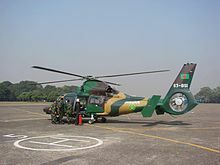 ^ "Eurocopter AS365 N3+ Dauphin helicopters enter service with the Bangladesh Army for use in humanitarian missions and VIP airlift". infodefensa.com. Retrieved 29 May 2015. ^ "Bangladesh To Join The Family Of C295W Operators" (Press release). Airbus Defence and Space. 11 October 2016. Archived from the original on 12 October 2016. Retrieved 14 October 2016. ^ Stevenson, Beth (11 October 2016). "Bangladesh orders single C295W". FlightGlobal. Retrieved 14 October 2016. ^ a b c d Momen, Nurul (2006). "Bangladesh-UN Partnership". The Daily Star. Archived from the original on 13 August 2007. Retrieved 2 February 2009. ^ Buerk, Roland (18 January 2006). 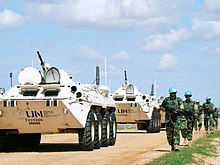 "The cream of UN peacekeepers". BBC News. ^ a b "Ranks and Insignia - Join Bangladesh Army". ^ "Rank Categories - Bangladesh Army". ^ "Cantonment Locations". Join Bangladesh Army. Bangladesh Army. Archived from the original on 18 June 2015. Retrieved 14 July 2014. ^ "Armoured Corps Center & School". Bangladesh Army. Archived from the original on 14 July 2014. Retrieved 14 July 2014. ^ Singh, Ravi Shekhar Narain (2005). Asian Strategic and Military Perspective. New Delhi: Lancer Publishers. p. 25. ISBN 817062245X. ^ "Army to get 97 more units in 4 years". The Independent. 16 July 2017. Retrieved 11 August 2017. ^ "Bangladesh Army to get 97 more units in four years, says report". Jane's 360. 26 July 2017. Retrieved 11 August 2017. ^ "PM reaffirms to do everything for modernisation of army". BSSNews. Retrieved 23 November 2015. ^ "Uphold dignity of national flag, PM to Army". The Independent. Dhaka. Retrieved 23 November 2015. ^ "Stay alert to face internal & external threats". Bangladesh Sangbad Sangstha. 13 May 2018. Retrieved 16 May 2018. ^ "Tender specification of vessel Type C (comd. vessel)" (PDF). dgdp. Retrieved 18 February 2017. ^ "WMS to build two combat tank carriers for Army". The Daily Asian Age. 5 July 2017. Retrieved 5 July 2017. ^ "Bangladeshi Army intends to buy 680 armored vehicles "Kozak-2m" and "Ataman"". uprom.info. Retrieved 11 August 2017. ^ "Technical specification for light tank" (PDF). dgdp. 10 September 2017. Retrieved 24 November 2017. ^ "Evaluation of 155mm Howitzer" (PDF). dgdp. 24 September 2017. Retrieved 24 November 2017. ^ "Evaluation of 122mm Howitzer" (PDF). dgdp. 21 November 2017. Retrieved 24 November 2017. ^ "Evaluation of LAV" (PDF). dgdp. 16 November 2017. Retrieved 24 November 2017. ^ "Procurement of 105mm howitzer" (PDF). dgdp. Retrieved 25 November 2017. ^ "সেনাবাহিনীর জন্য নতুন এভিয়েশন পরিদপ্তর হচ্ছে" (in Bengali). Daily BD News. 5 December 2017. Retrieved 20 December 2017. ^ "Technical specification of vessel Type B" (PDF). DGDP. Retrieved 2 February 2018. ^ "Technical specification of vessel Type A" (PDF). DGDP. Retrieved 2 February 2018. ^ "Tender for platoon level ATW" (PDF). DGDP. Retrieved 24 March 2018. ^ "Tender specification of Local Warning Radar" (PDF). DGDP. Retrieved 24 March 2018. ^ "Tender for surface to air missile" (PDF). DGDP. Retrieved 24 March 2018. ^ "Evaluation of multiple launch rocket system Type A" (PDF). DGDP. Retrieved 10 April 2018. ^ "EVALUATTON OF SUTTABLE SMALLS ARMS /ASSAULT RIFLE/SUB MACHINE GUN FOR BANGLADESH ARMY" (PDF). DGDP. Retrieved 10 April 2018. ^ "Technical specification of vessel Type A" (PDF). DGDP. Retrieved 23 April 2018. ^ "RE-EVATUATTON OF ANTI-TANK GUIDED WEAPON (MEDIUM RANGE) FOR BANGIADESH ARMY" (PDF). DGDP. Retrieved 27 April 2018.